My daughter started losing teeth quite early. 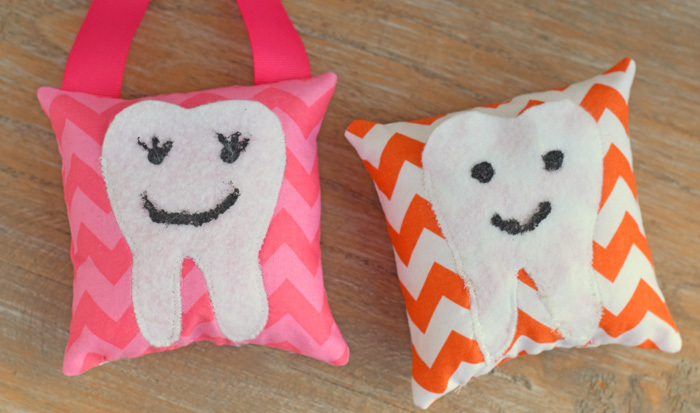 She had lost her first few teeth before starting kindergarten and before I even had a chance to make her this cute DIY Tooth Fairy pillow for those initial teeth. After comparing stories with other moms who had children years older than her, I began to worry that she was losing teeth too early. Thankfully, we go to a wonderful dentist who reassured me that it was completely normal for her to be losing teeth at this age. We’ve continued visiting this dentist with the triplets, and I grateful that my kids have a kind, knowledgeable dentist that we can go to with concerns. I’m aware that not all children have this advantage. Regardless of federal and state programs in place in the United States, tooth decay is still the number one chronic infectious disease in children, affecting 42% of 2-11 year olds. The Give Kids A Smile organization is a wonderful way to help in this cause. For 15 years, volunteers have provided oral health care to children who otherwise might not receive it. 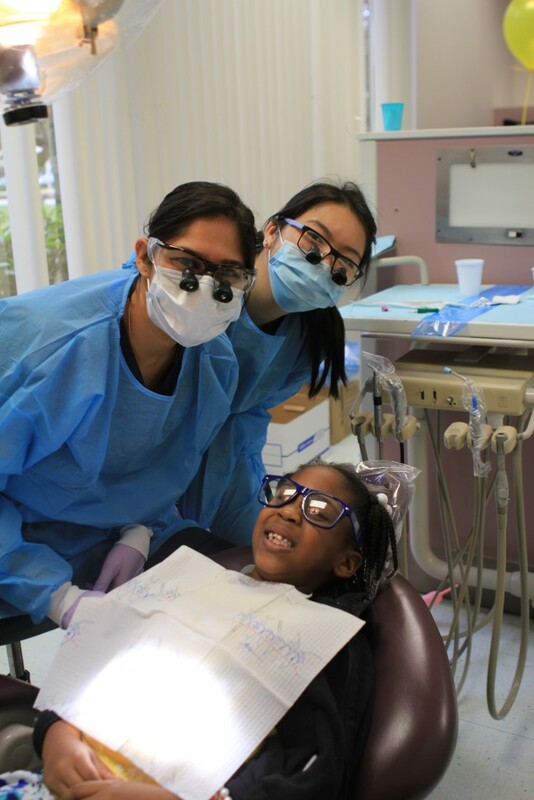 With support from the American Dental Association, the Give Kids A Smile program is now available in all 50 states and reaches more than 5.5 million children. Visit the Give Kids a Smile Page to see how you can attend, donate, or volunteer to this cause! 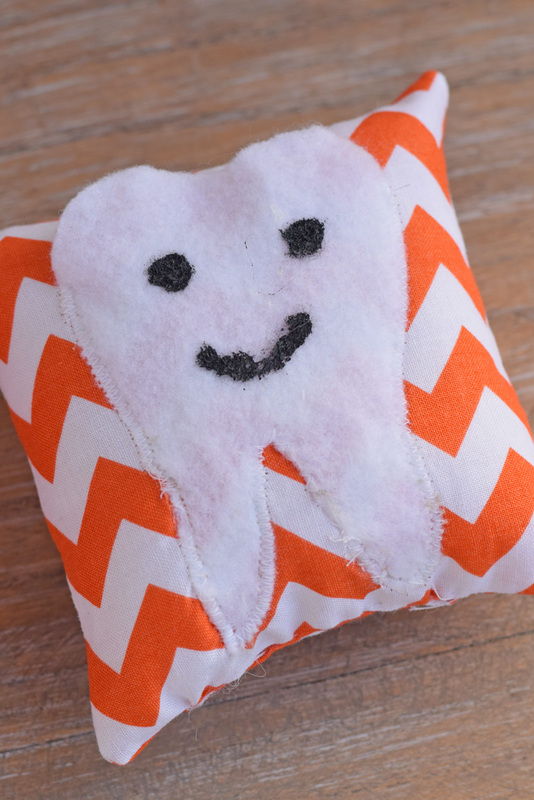 If you’d like to give something personal to the kiddos in your life that you know personally (think nieces, nephews, or your own kids), this DIY Tooth Fairy pillow is an easy sewing project. 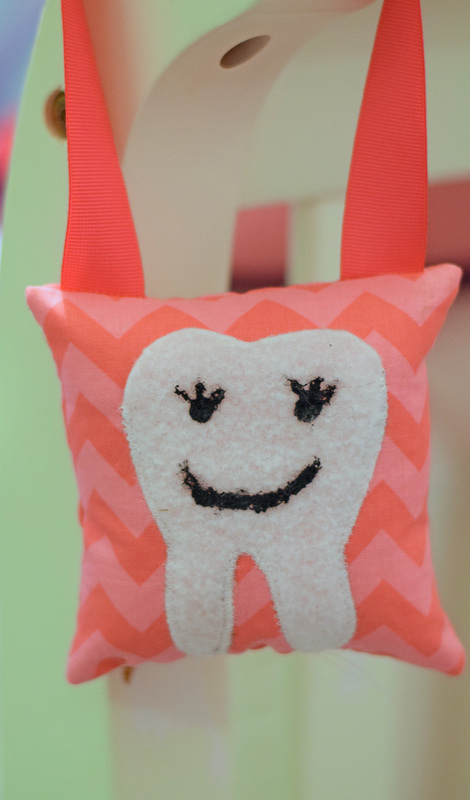 The kids can put their tooth inside for safe keeping until the tooth fairy snatches it. The hanging ribbon is optional. Add the ribbon for hanging on a bedpost. 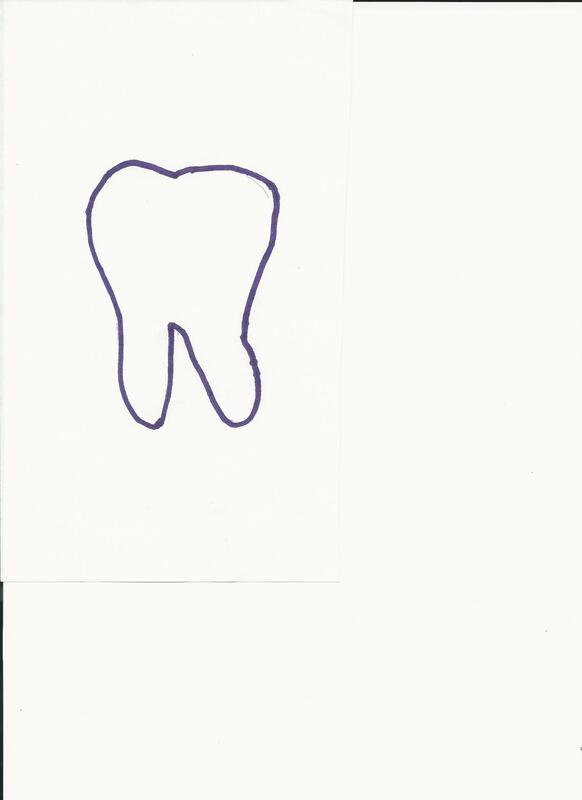 Download this tooth image to your computer. Click here to open a new tab with the image, and then right click it to save it. Print it off using your home printer. 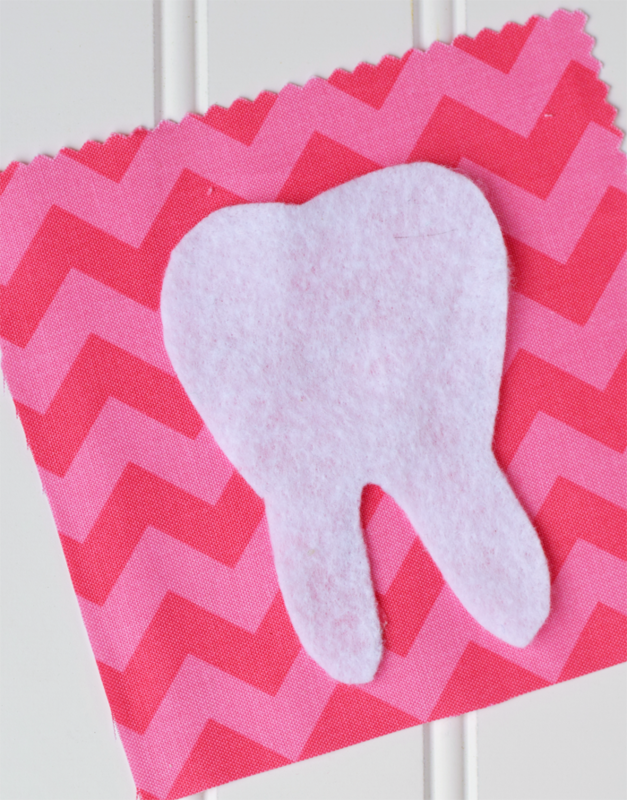 Cut out the tooth and use it as a pattern. Cut the tooth from the white felt using the pattern. 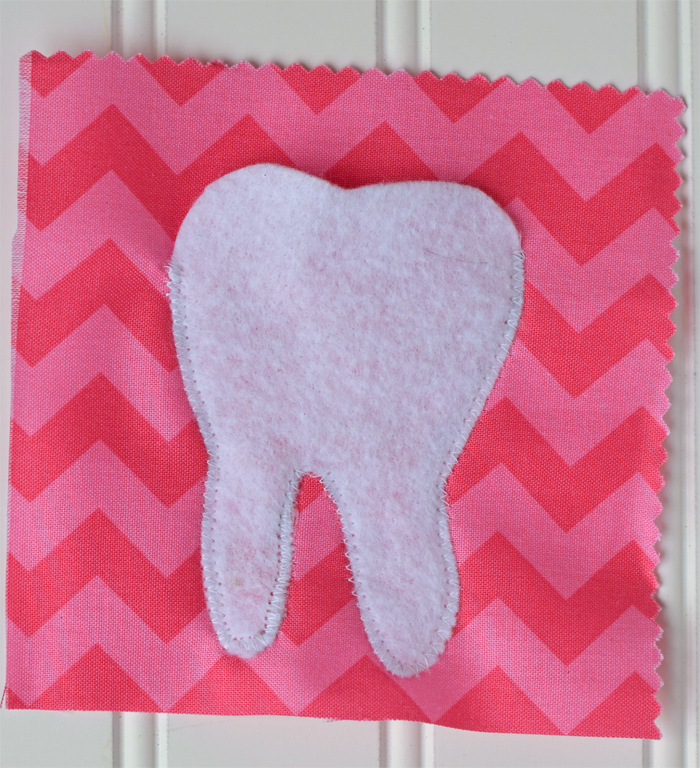 Place the felt tooth in the center of one of the cotton squares. Using the fabric glue, carefully glue the center of the “roots” down to the cotton. 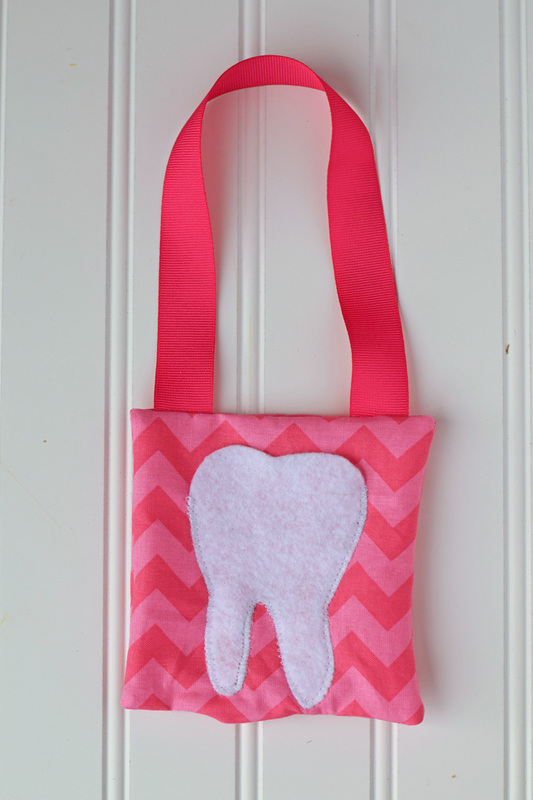 This is so that the tooth does not fall into the “root” openings and become stuck. Try to only glue down the center. The outer edges will be sewn onto the cotton with a zigzag stitch. Place the interfacing piece to the back of the cotton piece (the one with the tooth on it). Pin in place. 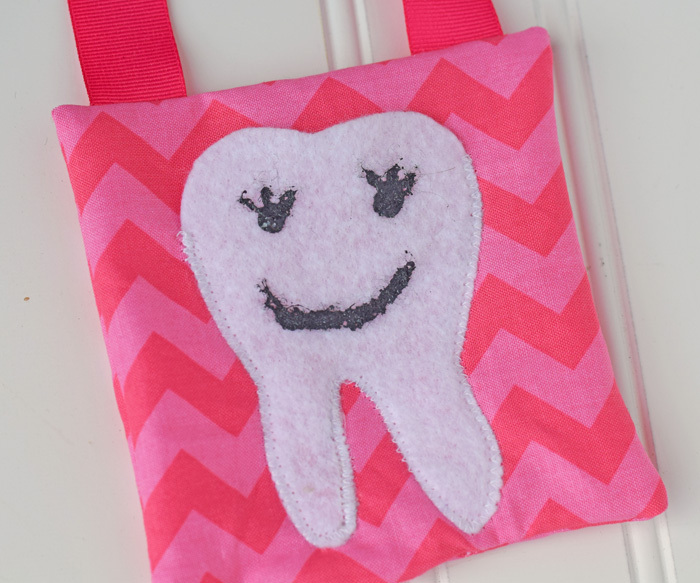 Using a zigzag stitch, sew the tooth to the cotton, leaving the top open. Pin the two cotton pieces, right sides together. If you are adding the ribbon, pin the ribbon inside the two cotton pieces during this step, as well. Sew around with a 1/4″ seam allowance, being careful not to catch the ribbon in the seam. Leave an opening at the bottom of the pillow for turning. Turn the pillow, right side out. 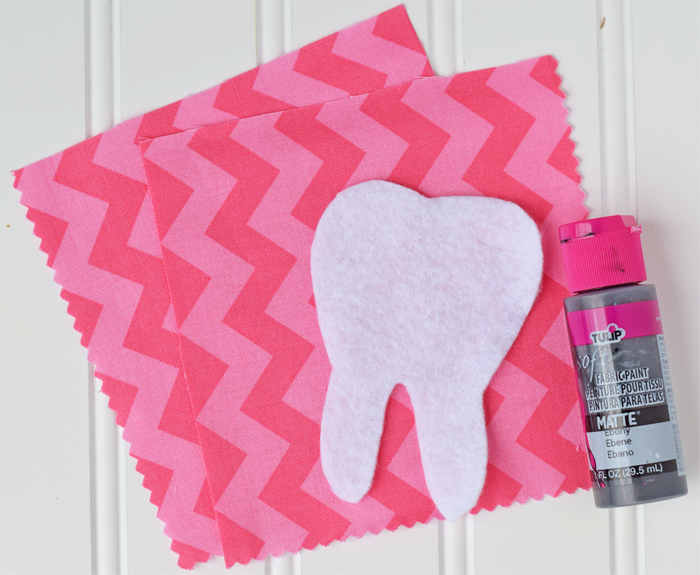 Use the black fabric paint to make a cute face on the front of the tooth. Let dry completely. Stuff the pillow with fiberfill. Hand sew the pillow closed with a slip stitch. Learn more about the Give Kids a Smile program by following their Facebook page. Learn more about dental health tips here. These are so cute!!! Makes me miss my days as a Dental Assistant! This is a cute pillow! Thanks for the stats on dental health in kids. We pay close attention to my son’s teeth! This is so cute! I will definitely try making one of these for my little guy. Thanks for sharing the link to Give a Kids a Smile facebook page. Very cute pillow. I had one that my mom made for me and always treasured it. This is so cute! The tooth fairy in my house sometimes has a very tough time finding the tooth under my son’s pillow! ha! This is an adorable post! 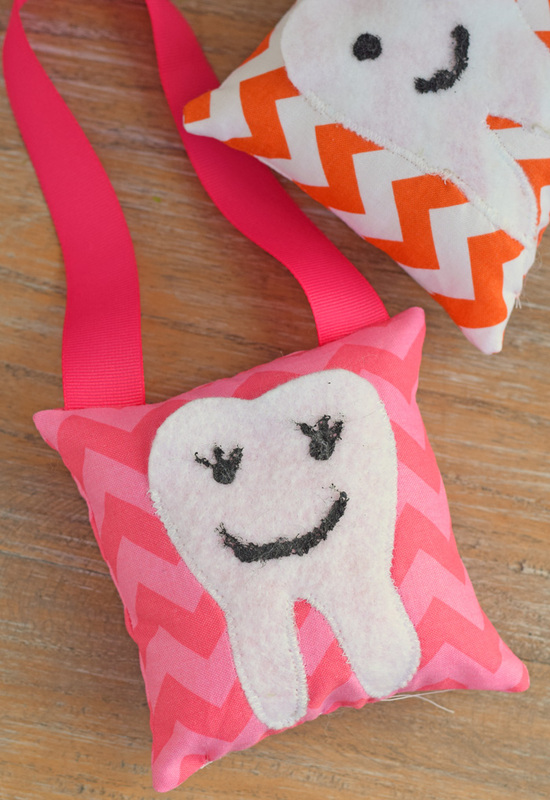 I love how easy the Tooth Fairy Pillow is to make. Thanks for sharing step by step pictures. Makes it even easier. This is adorable! I had a similar pillow when I was little and I loved it. I will have to make one for my daughter when she is older! These are very cute! My name is Cathy and I work for the ADA Foundation, which oversees the Give Kids A Smile program. Thanks for posting this information. If you’re looking for fun activities that will help kids remember to take care of their teeth, visit http://www.MouthHealthyKids.org where you’ll find activity sheets, games, puzzles, and videos – including Elmo!